I hope everyone is not too stressed over this holiday season with planning and gift buying. 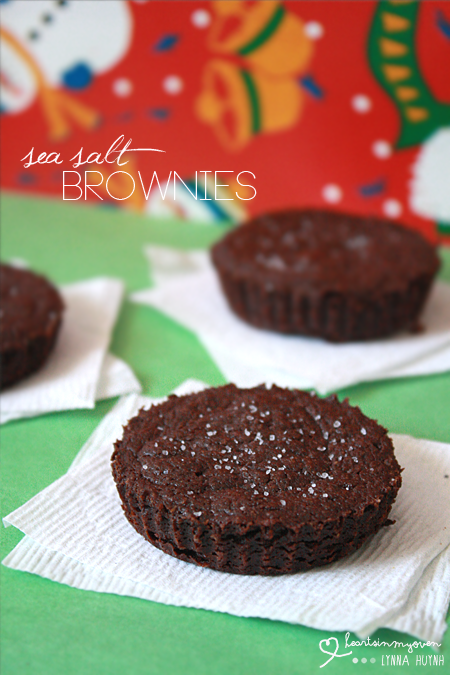 Today, I`m bringing some brownies...with sea salt! One day, one of my friends asked if I`ve ever made them before because she had some and loved them. I, of course, had not. I`m not a die-hard brownie fan. There`s only a few brownies I`ll eat. But, this blog is about "food for those we love" so I made it my task that day to find some recipes. It was hard, because I wanted these to be goooddd. Not, just good. My friend highly praised those brownies she had and I wanted to beat that. I found this recipe on Baker Chick`s blog and I decided to try this. It`s labelled as "fudgy", which is not something I normally prefer, but I was baking these for a friend. Since they were fudgy, I made them thin by using a regular cupcake pan and trimming the liners, so they won`t be too overwhelming. I was hesitant on the sea salt part because I knew my friend wanted sea salt, but I also knew others who are not sea salt fans. I settled for in-between. Some said they really liked these. Some said they wanted more sea salt (the friend who asked about these). Some said they preferred less sea salt. LOL. I`m not sure what to conclude! Personally, I thought they were good. 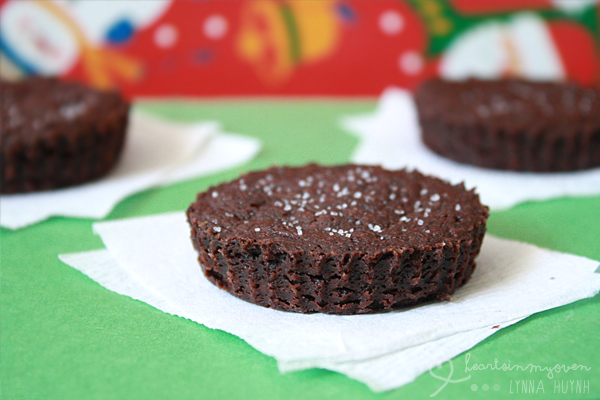 Prefect for Christmas treats as well, especially if YOU like fudgy brownies. I`ll like to end by mentioning my condolences to all those effected by the recent shooting in Newtown, Connecticut. I hope those effected will be able to experience joy and happiness one day. I also hope that our world can improve for the better, so we can stop whatever it is that makes people harm others. Please give and offer love, not hate. To brighten the mood a little, onto the BROWNIES. 1. If you want to make the brownies the pictured, cut regular cupcake liners a little more than half way down. 2. Make brownies and fill liners as directed.